Sue Dyson and Roger McShane. First published in Wine Talk, February 2018. 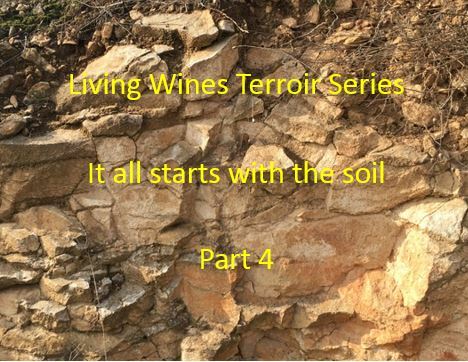 In the three previous articles under this title we examined the different rock types that are found in vineyards and then looked at how soils are created from those rocks by actions including physical weathering, chemical weathering and biological weathering. We then looked at the living creatures that inhabit the soils in vineyards and that work incessantly to improve the nature of the soil and to ensure that vines can absorb the vital elements that are present in the soil. We also alluded to the fact that we have major concerns about the use of systemic sprays such as pesticides, herbicides and fungicides in vineyards as they reduce the effectiveness of the beneficial biological agents in the soil by both killing the bacteria, fungi and worms that are so important and “chelating” (making unavailable to plants) the vital elements in the soil such as nitrogen, phosphorus and magnesium among others that plants need for growth and health. In this final article in the series we are going to explore the scientific literature that informed us about the negative effects of these sprays to prove that there is scientific merit in our claims. A healthy ecosystem is vital for the production of wines with life, energy, tension and flavour. There is a need to nurture living creatures above the ground and those in the soil to ensure that the vines thrive and the grapes are healthy. We have written in the past about the importance of ladybirds, wasps, bees, fruit flies, worms and bacteria in creating a healthy environment for vines and yeasts to flourish. We also have written about the need to create a diversity of plant life which, in turn, attracts different birds and insects that can have different beneficial effects on the vineyard. There have been lots of scientific papers that have alerted us to the dangers that sprays pose to life above the ground. In particular, the damaging effects of neonicotinoids on the health of bee colonies has led to that spray being banned in many countries. And it is not only bees. A recent report from Germany claimed that 75% of all flying insects have been killed by these sprays in the last 27 years. This is a disaster for the agricultural sector because flies, moths and butterflies are just as important as bees in pollinating flowers. Beetles and wasps also act as predators of non-beneficial insects. However there has not been as much research done on the effect that these sprays have on the all-important life below the ground such as worms, bacteria and fungi. We will start by examining the damaging effect that glyphosate-based sprays such as Roundup have on the soil and the creatures in the soil. The relationship between the soil and the uptake of minerals or mineral salts into vines is a complex one. Plants such as grapevines need sixteen elements to thrive and only three of these (carbon, oxygen and hydrogen) can be absorbed through the leaves of the plant. All others including the vital nitrogen as well as phosphorous, potassium, calcium, magnesium and others must all find their way into the plant through the roots if the plant is to maintain its health. The problem is that vine roots can’t absorb these elements or compounds formed from these elements without lots of help – and this help comes from living creatures carrying out vital work making the soil healthy and getting the elements into a form that can be beneficial for the plants. To us, this is one of the aspects of terroir that so little is written about. Terroir is often reduced to a discussion of rock/soil types and climatic conditions affecting the vineyard. But it is the silent work carried out below ground by a range of living creatures such as beneficial bacteria, earthworms and mycorrhizal fungi that is so important to plant health. When we say that this life within the soil is an aspect of terroir that should be given more prominence it is because different vineyards have different concentrations of specific bacteria that carry out specific work in the soil. The concentrations of mycorrhizal fungi with their flamboyant hyphae that form webs of tiny tendrils throughout the soil seeking out beneficial elements for the vines also varies. And, very importantly many recent studies have shown that varieties of yeast can vary from one end of a valley to another and from one vineyard to the next. Different varieties of yeast produce different polyphenols which in turn play a part in providing flavour and structure to the wine. Therefore, if wine fermentation relies on the indigenous yeasts rather than commercial yeasts, the wine will be a truer reflection of what is happening in the vineyard. And this is where our thinking has taken us – to the vital role of mycorrhizal fungi and the fact that healthy, living soils are absolutely essential for the transfer of nutrients through the root system and into the plant. Study after study that we have read has confirmed this vital fact. We are going to explore on of the biggest factors in reducing transfer of nutrients to plants and that is the use of systemic sprays such as pesticides, herbicides and fungicides. We will concentrate on glyphosate-based sprays because they are by far the most common in modern agriculture and are one of the most problematic, especially with the dramatic increase in the volume of these sprays used throughout the world. Well, is Roundup (which is based on glyphosate, but much more dangerous) a problem in controlling weeds and are there any follow-up effects for vineyard managers? We are going to examine four areas where science says that glyphosates have a deleterious effect on the soil and creatures that live within the soil. Let’s start with earthworms that condition the soil and provide pathways for roots and nutrients to enrich the soil. The role of bacteria in helping to break down rocks into soil is well known, however the role of earthworms is now receiving the attention it deserves in conditioning the soil for the plants. A recent meta-analysis of the peer-reviewed literature showed that earthworms contribute significantly to the productivity of plants. “on average earthworm presence in agroecosystems leads to a 25% increase in crop yield and a 23% increase in above ground biomass. The magnitude of these effects depends on presence of crop residue, earthworm density and type and rate of fertilization. The positive effects of earthworms become larger when more residue is returned to the soil, but disappear when soil nitrogen availability is high. This suggests that earthworms stimulate plant growth predominantly through releasing nitrogen locked away in residue and soil organic matter”. A paper by Gaupp-Berghausen (2015) in a journal in the same stable as the prestigious Nature magazine showed that glyphosate-based herbicides reduced the populations of earthworms in soils sprayed with glyphosates by reducing their capacity to breed. Even more worrying, a paper by Zaller et al (2014) showed that glyphosate usage reduced the interactions between earthworms and symbiotic mycorrhizal fungi in the soil. And, as we mentioned earlier in this article, this reduces the ability of the vine to absorb 13 out of the 16 essential elements that the vine needs for growth and survival. We even read in the scientific literature about the efforts of earthworms to avoid soil that has been sprayed with glyphosate. “earthworms increasingly are being considered as sentinels, or biomarkers, of soil health and integrity”. In the previous article in this series we established the important effects of bacteria in the soil especially in breaking down the soil to make important elements such as Nitrogen, Manganese and Magnesium available to the plants that grow in that soil. We are therefore wary of anything that is used in agriculture that diminishes the effectiveness of bacteria in the soil. In an important paper published by a group of German scientists (Shehata et al) they demonstrated that glyphosates have very little effect on bacteria that are dangerous for humans such as Salmonella but do have a deleterious effect on bacteria that are beneficial to humans. The use of glyphosate modifies the environment which stresses the living microorganisms. The aim of the present study was to determine the real impact of glyphosate on potential pathogens and beneficial members of poultry microbiota in vitro. The presented results evidence that the highly pathogenic bacteria as Salmonella Entritidis, Salmonella Gallinarum, Salmonella Typhimurium, Clostridium perfringens and Clostridium botulinum are highly resistant to glyphosate. However, most of beneficial bacteria as Enterococcus faecalis, Enterococcus faecium, Bacillus badius, Bifidobacterium adolescentis and Lactobacillus spp. were found to be moderate to highly susceptible. Mycorrhizal fungi play a number of vital functions in the vineyard, in fact they colonise the roots of more than 80% of plants that grow on this planet. These tiny fungi are able to send out small tendrils called hyphae that locate elements in the soil such as Nitrogen and Phosphorus which are vital for plant growth and help transmit these elements in various forms into the plant. They do this by burrowing into the root of the vines and sending out the hyphae into the surrounding soil. The relationship between plants and these fungi is a fascinating one because it is symbiotic. The vines receive the vital elements they need through the actions of the fungi and they, in turn, send sustenance such as glucose and fructose to the fungi. A paper by Druille and others in the Applied Soil Ecology journal found that glyphosates reduced mycorrhizal fungi viability and concentration in the soil. One of the most common complaints we hear about modern agriculture is that “things don’t taste as good anymore”. This applies to potatoes, cherries, carrots, beans – in fact just about anything that grows in the soil. It also applies to grapes. So what has happened over the past fifty years to bring about this decline in flavour. There are three major problems that contribute. The first is the excessive use of irrigation in many parts of the world that forces the plants to grow quicker and not giving time for all the flavour compounds to develop fully. The second is the use of nitrogen-based fertilisers which damage the fungi in the soil and hence reduce the uptake into plants of elements that are essential for flavour development. And the third, of course, is the widespread introduction of systemic sprays during that time. We will just concentrate on the sprays because there is direct evidence concerning the problems they cause. We have already covered the problems caused by the effect of glyphosates on the important living creatures in the soil. But there is another problem. Glyphosates are chelators. What this means is that the compounds in glyphosate actually “bind” to elements such as magnesium, manganese, iron and calcium in the soil and make them unavailable to plants. Plants need compounds based on these important elements for growth and for the development of flavour compounds. For example, manganese is required for at least 25 enzymes that are used in processes such as photosynthesis and nitrate uptake. However, if manganese is chelated by glyphosates it is no longer available to the plant. It is no surprise to us that glyphosate behaves this way since it was originally patented as a chelator. There have been many studies relating to the chelation effect of glyphosates all of which contribute to lack of flavour in grapes, lack of immunity of grapevines to disease and lack of micronutrients required for the overall health of the plant. There is also another problem starting to be found in grapevines – they are not lasting as long as they used to! We work with producers throughout France who still tend vines that are over or getting close to 100 years old. As the vines get older, the yields are reduced but the quality of the few grapes that are produced is often exceptional. However, a number reports are starting to emerge of grapevines that are close to fields where sprays are used on other crops are seeing reduced lifespan of the vines. This requires more research to provide more evidence but it will be an issue that we will follow up as further papers are published on the topic. This article only scrapes the surface of the research that is being carried out on the importance of preserving and caring for the soil in which our plants grow. We hope we have provided some warnings about the use of chemical sprays in the vineyard and given you some insight into why we believe so strongly that systemic sprays should be removed from our agricultural landscapes. And we haven’t even delved into the effects that these sprays have on human health! Hallmann et al (2017) More than 75 percent decline over 27 years in total flying insect biomass in protected areas. https://doi.org/10.1371/journal.pone.0185809. Cheng, X., and Baumgartner, K. Overlap of Grapevine and Cover-Crop Roots Enhances Interactions among Grapevines, Cover Crops, and Arbuscular Mycorrhizal Fungi Pages 171-174 In: Proceedings of the Soil Environment and Vine Mineral Nutrition Symposium. American Society of Enology and Viticulture, 29-30 June 2004, San Diego, CA. Baumgartner, K. 2006. The Role of Beneficial Mycorrhizal Fungi in Grapevine Nutrition. American Society of Enology and Viticulture Technical Update 1:3. Dr Robin Mesnage of the Department of Medical and Molecular Genetics at Kings College in London presented data showing Roundup is 1,000 times more toxic than glyphosate alone. van Groenigen, J. W. et al. Earthworms increase plant production: a meta-analysis. Sci. Rep. 4, 6365, 10.1038/srep06365 (2014). Gaupp-Berghausen, M. et al. Glyphosate-based herbicides reduce the activity and reproduction of earthworms and lead to increased soil nutrient concentrations. Sci. Rep. 5, 12886; doi: 10.1038/srep12886 (2015). Zaller, J. G., Heigl, F., Ruess, L. & Grabmaier, A. Glyphosate herbicide affects belowground interactions between earthworms and symbiotic mycorrhizal fungi in a model ecosystem. Sci. Rep. 4, 5634, 10.1038/srep05634 (2014). Verrell, P. & Van Buskirk, E. As the worm turns: Eisenia fetida avoids soil contaminated by a glyphosate-based herbicide. Bull. Environm. Contamin. Toxicol. 72, 219–224 (2004). Gaupp-Berghausen, Mailin & Hofer, Martin & Rewald, Boris & Zaller, Johann. (2015). Glyphosate-based herbicides reduce the activity and reproduction of earthworms and lead to increased soil nutrient concentrations. Scientific Reports. 5. 12886. 10.1038/srep12886. Shehata et al (2012) The Effect of Glyphosate on Potential Pathogens and Beneficial Members of Poultry Microbiota In Vitro. Current Microbiology. Druille, Magdalena & Omacini, Marina & Golluscio, Rodolfo & CABELLO, R.A.. (2013). Arbuscular mycorrhizal fungi are directly and indirectly affected by glyphosate application. Applied Soil Ecology. 72. 143-149. 10.1016/j.apsoil.2013.06.011. Cakmak et al, Glyphosate reduced seed and leaf concentrations of calcium, manganese, magnesium, and iron in non-glyphosate resistant soybean. European Journal of Agronomy. 31 (2009) 114–119.